In the middle of end-of-school-year-madness, I managed to finish my Rainbow Confetti quilt. This string quilt was foundation paper pieced and uses Vanessa Christenson's awesome Ombre Confetti Metallic fabric for Moda. This quilt is a gift for a very special teacher. I thought I was way ahead of the game this year. I pieced it in April and had plans to quilt it right away, and then sit back and relax my way through May. Well, you know what they say about the best-laid plans? After I finished the quilt top, the kids and I had the stomach flu, one after the other after the other. Once we were all better, it took a couple of weeks to get back to this project. Well...I finished with 4 days to spare this time! I mentioned this is a foundation paper pieced quilt. I created my own template with 3 strings of color per side and white in the middle. The squares are 8" x 8" finished and the quilt is 7 blocks by 8 blocks, or 56" x 64". 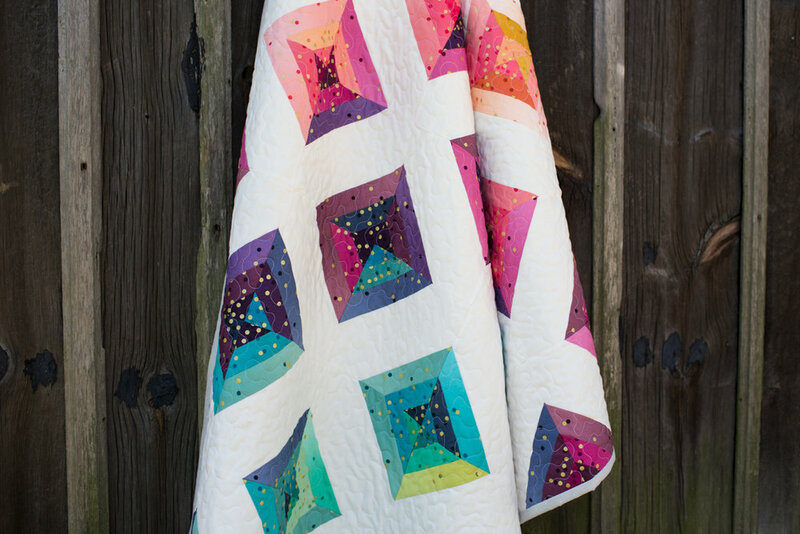 I don't have a pattern for sale for this particular quilt, but you could get a similar look using Vanessa's ombre fabrics with my Prism quilt pattern. Ombre fabrics are so fun. So many shades of color in each fat quarter! For the backing, I used Cotton+Steel's Sprinkle fabric. I love the neutral base for the pops of color on the front. I quilted this using my BERNINA's BSR foot, in a meandering free motion pattern using Aurifil 50wt white thread. Definitely my go-to quilting design. We have been so lucky to have amazing teachers again this year at school. My daughter is wrapping up her final days of elementary school, and I'm getting surprisingly sentimental over it! It's exciting to watch them grow and become their own people, but hard at the same time. Here's the to start of a fun summer!